The Jigokudani Yaen-koen, or Snow Monkey Park, is located in the Valley of Yokoyu River in northern Nagano Prefecture. It’s the place where all of the photos of cute monkeys bathing in onsens. It has been around forever and is a staple in all Japanese travel guides. I hope you had a great few weeks, and are ready for more blog posts, because here they are. The wild monkey park was founded in 1964, and since then it has been popular with everybody. It takes roughly 30min [2 kilometers] along the Yumichi Natural Trail to get to the park, and although there are quite a few ups and downs, it is mostly rather flat. Especially in winter, you will need proper shoes to not slip and fall. There are limited number of parking spots close to the park, and most visitors come by bus. If you want a very comprehensive guide on how to get there by various means of transportation, here it is. Ticket prices range from 800¥ for adults [6.5€ using the current exchange rate] to 400¥ for children 17 and under [3.25€]. For anything else, such as disability and group discounts, check the image above or go to their website. Yes, indeed, a lot of monkeys. That is really all you should expect from this wild monkey park. You are not allowed to feed the monkeys and you also shouldn’t come to close to them. They can shy away if you come to close, but funnily, this doesn’t happen if you look at them through a camera lens. You are not permitted to bring large camera equipment like bulky tripods in close vicinity of the monkeys either. You will probably have seen a lot of images from here pop up on social media, but I thought I’d show you some of the photographs I took. 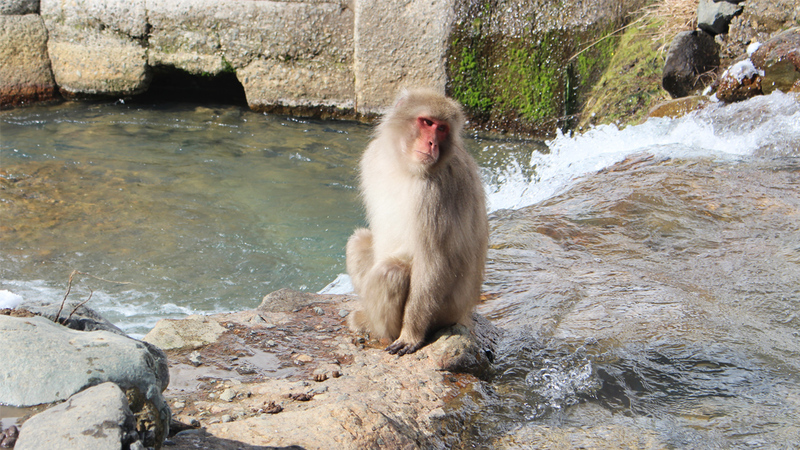 We were rather unlucky as only very few monkeys actually entered the Onsen that day. Who new baby monkeys could be this cute… probably everyone. Don’t feed the Monkeys | You might spot some monkeys on the trail. Also, it might snow heavily and be very slippery. I am truly sorry that I haven’t posted anything in a long time. I visited the Monkey Park several weeks ago, and this post has been sitting in my drafts file for way to long. I have a lot to talk about though so expect some more frequent blogging on this site. Spring vacation is coming up so I’ll be doing a bit more traveling. I would really recommend you checking out the Jigokudani Yaen-koen if you ever have the chance, if you do, send me a picture or tag me on social media stuffs, the links to mine are in the About section, I post more regularly on Instagram if you want to see these images way ahead of time.